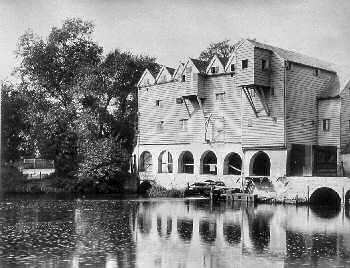 Horstead watermill was the last mill on the Bure, it was also one of the biggest, best known and most photographed mills in the county. 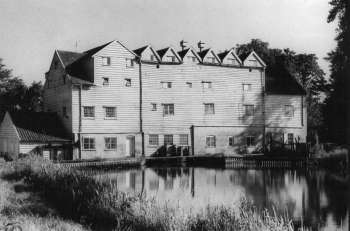 However, for several hundred years there were two mills under the same ownership at Horstead, the second being a fullmill that ceased to operate in the 1700s. 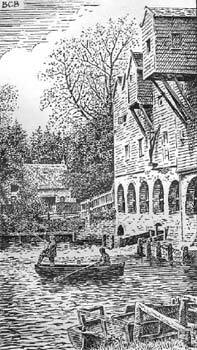 The lords of the manor have ... one water-mill for grinding corn and another mill for thickening woollen cloth commonly called a grist-mill and a fulling-mill. 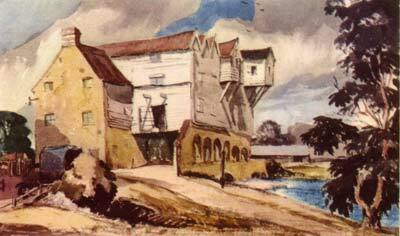 In 1809 the fullmill was reported to be very ancient and dilapidated. The site was probably at least Saxon, it was recorded in Domesday and mentioned as belonging to the Benedictine Priory at St Benet's. When King Henry Vlll dissolved the monasteries he presented it to King's College Cambridge. 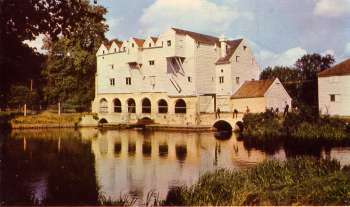 Ownership remained with King's College over the centuries until 1910, when R. J. Read bought the mill. There were two wheels, the largest was the older and was undershot with the other having been replaced by a more powerful turbine in later years. 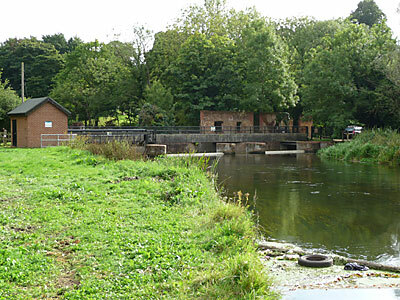 By 1957 only the turbine was being used to drive the mill mixing machinery. 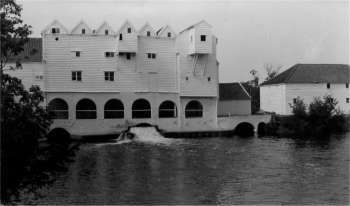 The mill ceased to grind corn for flour early in the early 1900s possibly as a result of the loss of its water transport after the 1912 flood. 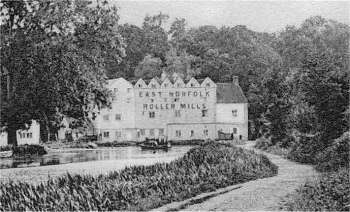 However, corn was ground once more in 1915 after Read's Norwich mills broke down and this carried on until the end of WW 1 when the mill reverted back to producing animal feed. Although hopper feed mixing machines had been installed, many of the old flour dressing and milling machines still remained to the end. 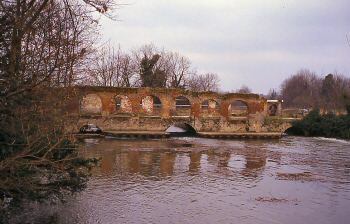 The final structure was probably built in 1789 to take two pairs of stones. The building was mainly of white weatherboard over a brick lower floor consisting of six dark brick arches. 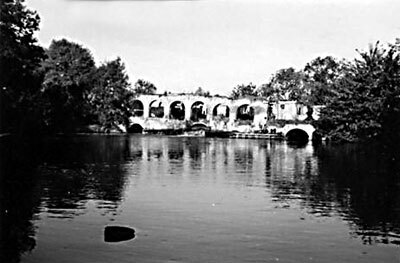 The pantiled roof section on the downstream side had six small matching gable sections with a seventh larger one to the right. 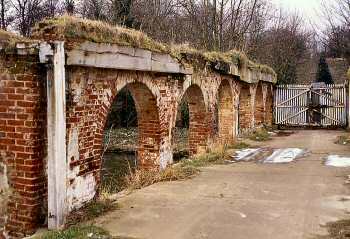 The 4th and 7th gables bore lucums for the loading and unloading of wherries that came down the Aylsham Navigation, which had been completed in October 1779. 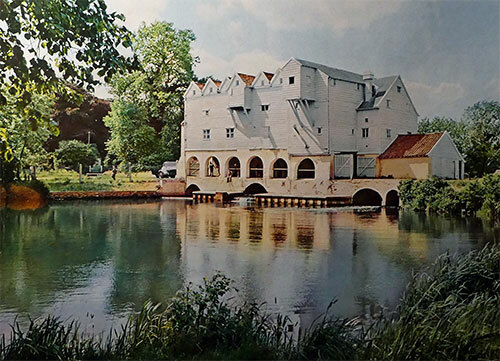 The spacious new built Water Corn Mill situate at Horstead in Norfolk within 7 miles of Norwich upon the Navigable river running to the Port of Great Yarmouth between which and the Mill there is no toll payable. 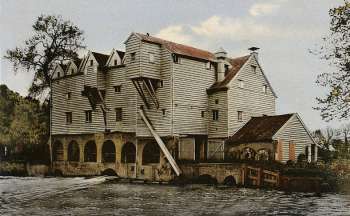 The Mill is built on an improved plan, is capable of manufacturing 300 quarters of wheat weekly and is now in the occupation of Messrs Colls and Watts, the proprietors, who have mutually agreed to dissolve their Partnership at Michaelmas next at which time or sooner the Purchaser may have possession of the Mill. 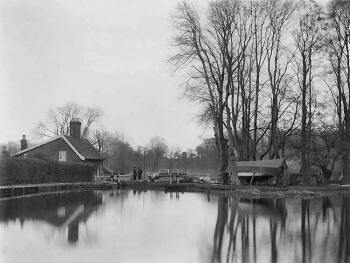 In May 1773 An Act of Parliament passed for making the River Bure Navigable. But the Navigation was not completed till 1779. 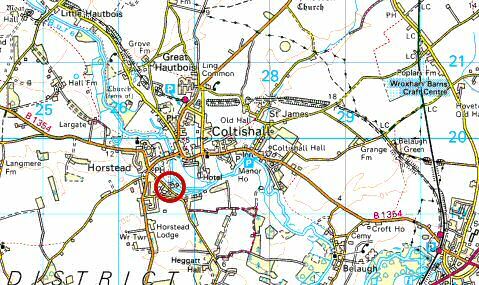 It extends from Colteshall to Aylesham for boats of 13 Tons Burden & Cost sox thousand & one punds - To the Prejudice of the Trade of Horstead Mill..... and to the Great Damage of T J Batcheler, Esq's meadows & royalty from Colteshall to meyton Bridge. 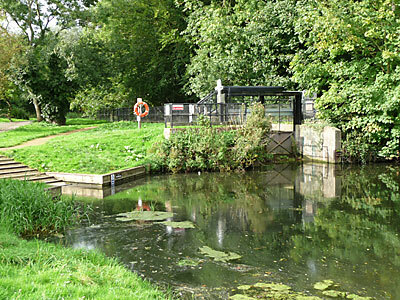 The land being frequently flooded & The Fish & Swans Disturbed or Stolen. 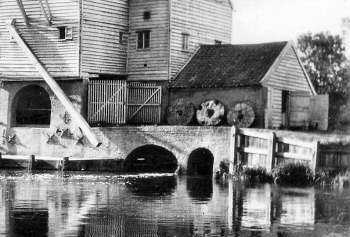 The WINDMILL driving three pairs of Stones for Wheat and one pair for Barley; and the Steam Mill adjoining driving three pairs of stones. Situate at Stalham in the County of Norfolk. Apply to Messrs. Clowes & Flowerdew, Norwich or to Mr. Samuel Cooke, Horstead Mills. 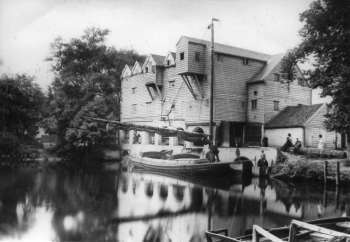 TO BE LET with possession at Michaelmas next, the WINDMILL driving three pair of stones for Wheat and one pair for Barley and the Steam Mill adjoining driving three pair of stones. Situate at Stalham in the County of Norfolk. For particulars apply to Messrs. Clowes & Flowerdew, Norwich or Mr. Samuel Cooke, Horstead Mills. King Street, Norwich, Feby. 12-1864. 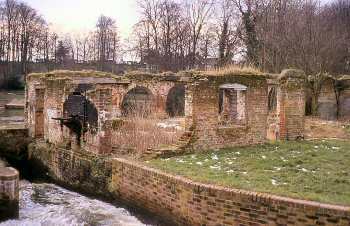 Having carefully gone through the items in reference to a New Water Wheel in Horstead Mills I find there will require three New Cast Iron Ring fitted and bolted together. All new float boards, Back boards and Oak Starts. Bolts and Nuts with Mens time fitting and fixing the same and taking out the old Wheel will be about one hundred and ten pounds and all the old materials. Back Boards 12" wide, 9ft long, 1" thick. Float Boards 12" wide, 9ft long, 1" thick. Struts, Oak 4" wide 2ft. 6" long 1" thick. Extra Bolts about 72 long to bolt arms together. Wedges about 8" long, 3" Wide, 2" thick. Oak Wedges, 12" long 6" wide 2" thick for Hanging Water Wheel. Time for 3 men, 4 Weeks each. By early evening on 2nd September 1939 Mr. Godbold, the Horstead Billeting Officer had placed all the evacuees in homes around the village – except two – a boy of thirteen and a seven year old girl, cousins. None of the households he had approached could accommodate these two children so he was immensely relieved when Mr. R. J. 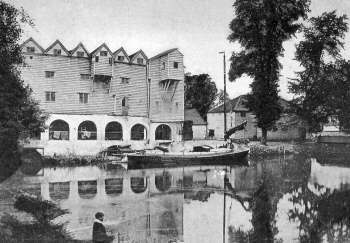 Read, the owner of Horstead Mill, offered to take them in. I was the seven year old, and sublimely unaware of what problems had been caused by my electing to be evacuated with my cousin rather than with my own school. The next morning Mr. Read called together all the members of his household; I can remember quite a number of people all standing in the Courtyard in front of the Stables, listening attentively as Mr. Read announced that England was now at war with Germany. Naturally enough, the implications of this announcement went straight over my head. 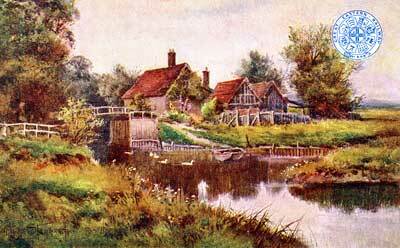 Mr. and Mrs. Read lived in the Mill House with their three daughters, a cook (Jean) and a housemaid (Kathleen). They also employed a number of outside staff to care for the grounds and the animals. Ever thoughtful, they quickly invited my mother, my uncle and aunt to visit and stay at the Mill House to reassure them that we were happy and being well cared for. In fact, I was having a wonderful time. Mr. Howell, the Headmaster of my cousin’s school, eventually set up a classroom for the boys in the Village Hall. This took about six weeks to arrange and during that time we explored the countryside and generally enjoyed the unfamiliar liberty. The youngest daughter of the household, Marigold aged 12, took me under her wing and I was allowed to ‘help’ her; she rose at 6.00 am each day and her first task was to take water to the horses. The galvanised iron buckets were very heavy. We carried them down the bank of the little stream that ran close by and could only half fill them with the clear, cold water as they were beyond our combined strength to carry if they were full. Marigold was small, wiry and very strong for her age. 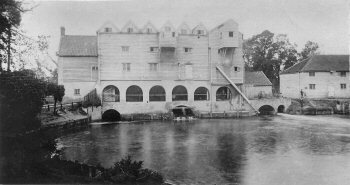 When this chore was done we mixed up a smelly concoction of bran, filled bowls with grain and carried them through the Mill, deserted at that time in the morning, out to the ducks and hens all around the Mill Pond. While they were feeding we collected eggs and carried them back to the house. Quite often we stopped inside the Mill to feed the cats although this was frowned upon as the cats were supposed to fend for themselves and survive on the abundant supply of mice and rats attracted by the Mill smells. 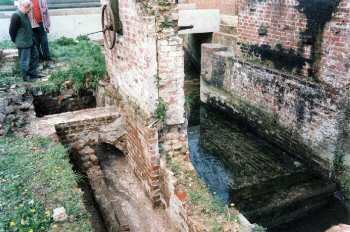 I was not allowed into the Mill while it was working – not that I minded, as to a small child it was dreadfully noisy, smelly and a pretty frightening place to be. 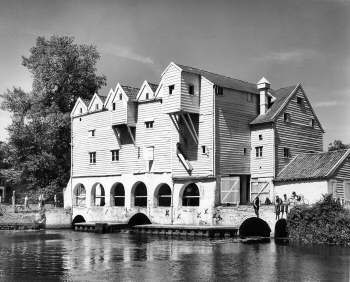 In the early morning it was empty but never quiet; the timbers creaked and groaned all the time as if they were complaining, and the rush of water through the Mill Race seemed deafeningly loud to me. I was also fascinated by the eel boxes on either side of the Race. One day, on an errand for Jean, the Cook, I went into the larder and saw a plate of black shiny eels, cut up and ready for the pot. Imagine my horror when I touched a piece experimentally and it moved on the plate. I’ve never willingly encountered eels since then. The wonderful period of freedom had to come to an end and I was duly taken along to Horstead School Infants class. My teacher was Mrs. Ida Durrell and I have the happiest memories of being taught by her as she was kindness personified and made lessons thoroughly enjoyable. My cousin and I were both very sad to have to leave the Reads and Mill House. As an adult I can understand their decision to move to a smaller property, easier for them to manage, although at the time I was upset. Their staff were all being conscripted, Jean and Kathleen were joining the A.T.S. and the men were being called up. 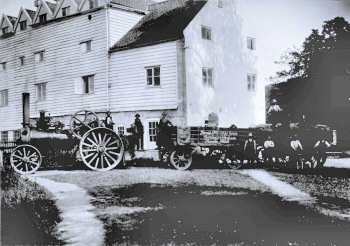 Mr. and Mrs. Read tried to take us with them but were not allowed to move us out of Horstead village – red tape and bureaucracy prevailed - so we were finally moved to The Forge where Harry and Lily Foulger, the Blacksmith and his wife, made us very welcome. 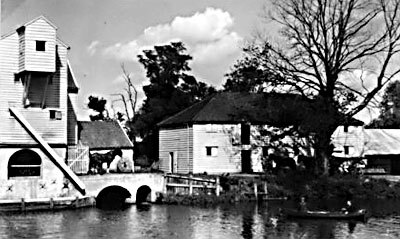 I stayed there with them until mid May 1945 and left Horstead Village with great reluctance as well as vivid and happy memories. 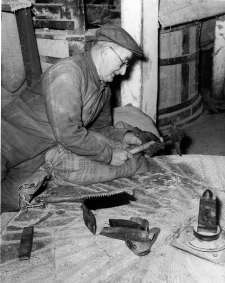 It was nice to see a picture of my husband's uncle, Jack Drayton (stone dressing 1960). I believe it was taken from an Anglia TV documentary made about that time. As far as I'm aware, Jack was the last miller. He lived to a good age and served in Mesopotamia in the First World War. I remember him coming to my wedding in 1969. His wife Ida was the village schoolteacher. 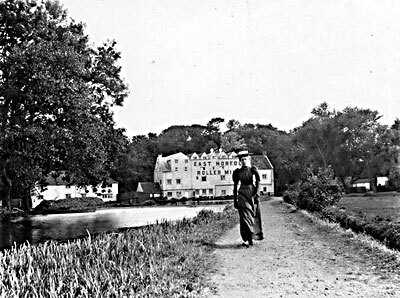 She'd been brought up with her three sisters and one brother (my father-in-law, Leslie Durrell)at The Limes in Horstead. We were down last summer, looking round the mill ruins whilst my husband reminisced about school holidays spent playing with the mill cats and "helping" Uncle Jack. 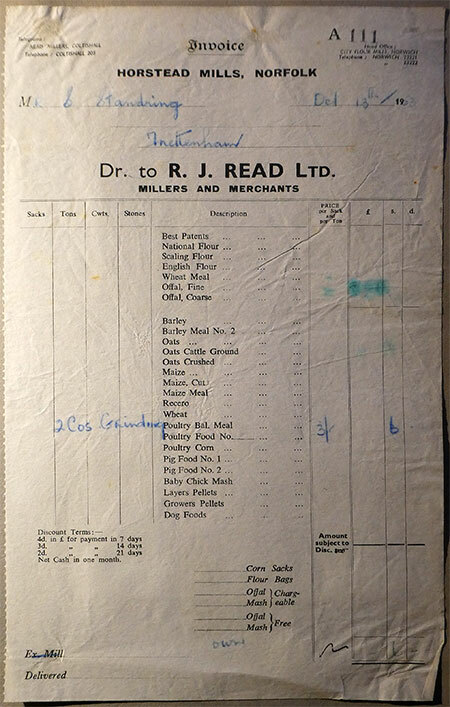 William Woolston snr was listed as journeyman miller in the 1851 census and his son William was at that time working at Hoveton Steam Mill. 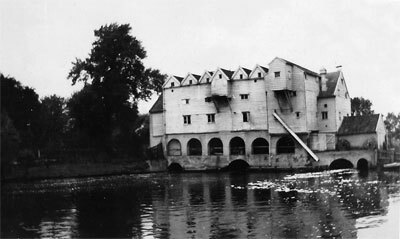 Horstead Mill was gutted by fire on 23rd January, 1963, which was one of the coldest winter's in many years. Three appliances attended the blaze. Holes had to be carved in over a foot of ice in the river to allow access for the water hoses and the even then water froze on the ends. 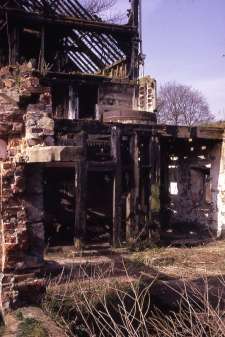 Although the fire was brought under control within an hour, it was too late to save the mill. It is thought the cause of the fire may have been an electrical fault. 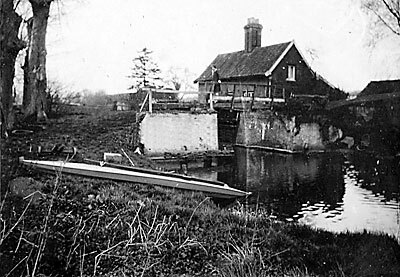 On 11th May 1973 the Eastern Daily Press reported that the East Suffolk and Norfolk River Authority had almost finished building a water gauging station on the mill site to measure the flow of the river. At this time Read's, who still owned the site, were contemplating a hotel using outline planning permission that had been granted some time ago but this did not come to fruition. I bought a small notebook with some sketches and poems in at an antiques fair about ten years ago. I have recently been researching the owner. I have found this to be Harry Colls who is the great grandson of John colls the last Colls mentioned in the timeline on your website. John Colls son was a flour merchant in London, his son Lebbens was a picture dealer, and Harry Colls, his son, was an Artist and Draughtsman. His brother Walter was a photo etcher and engraver of some note, and is mentioned on many websites as being quite cutting edge in his time. I have researched some more on the family. "Colls was a marine painter who exhibited pictures at the British Institution, 1852-54, from an address in Camden Town but practised for a longer period. His work is competent and attractive, and he was certainly prolific since examples regularly appear on the market. 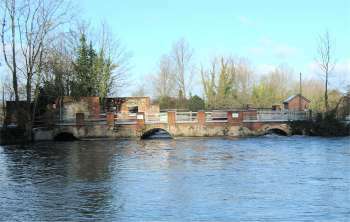 His dates were not known until about 2004 when a genealogical web posting stated that he was born in 1812 at Horstead, Norfolk (on the outskirts of Coltishall), into a family with a local history as owners of water mills. 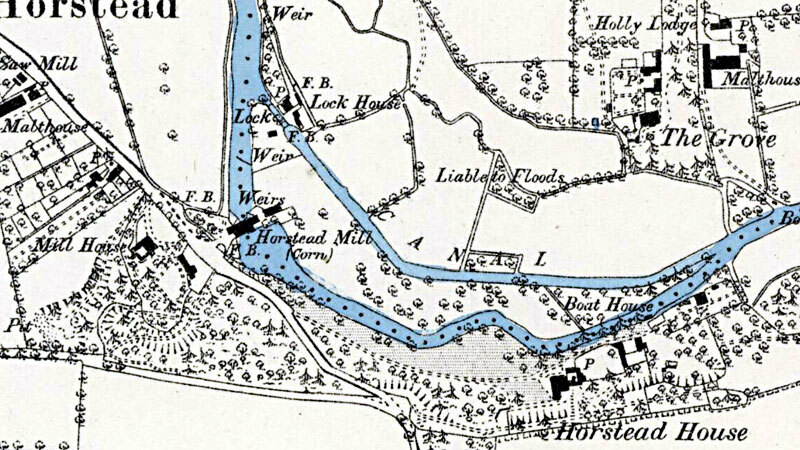 It is now fairly clear that his grandfather was John Colls, miller and farmer, who with H. P. Watts rebuilt Horstead Mill in 1789, was it part owner until 1797, and died in 1806. He appears to have had a son (Richard ?) 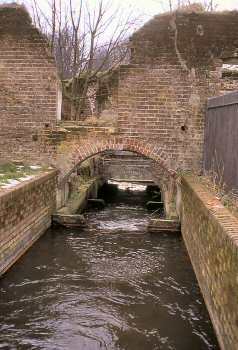 , who was a flour merchant in London , and Ebenezer was one of the latter's children. He was both a picture dealer and an artist, though how his career as both began is not yet known. 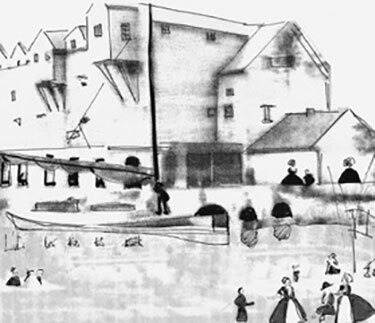 In January 1841 he married Harriet Beal, a Kent-born girl about ten years his junior, in the Thanet area (in or near Ramsgate) and they had four daughters and three sons who figure in the St Pancras, London, census returns of 1851 – 81: Richard, the eldest son, became a bookseller, and his younger brothers eventually well known artists; Walter as an etcher and engraver and Henry (Harry), as a late-19th-century marine painter. The eldest child, Harriet, initially taught music and Sarah became an accountant. The third and fourth daughters were Isabella (d.1885) and Florence (the youngest child, born about 1865). In the 1851 census Ebenezer's profession is given as ‘picture dealer'; in that of 1861 ‘marine painter'; in 1871 he was living on ‘ “Dividends” ‘ (with the landscape painter, Edmund Gell, a boarder in his house) and in 1881 he is again called ‘artist'. His final address from before 1871 was 79 King Henry's Road, Regent's Park, and he died there aged 75 on 23 September 1887 (‘Morning Post', 28 September)". I have written a book about my great grandfather called “The True Tale of Charlie Plant.” under my maiden name Jane Sherwood. Charlie's great grandfather was John Colls (1744-1806) he married Elizabeth Everard in 1768 and they had 11 children between 1769-1788. His son Richard Colls (1775-1836) married Sarah Hood Ansell in 1802 and they had 6 children between 1802-1818 including my great great grandmother Mercy Colls, Charlies mother. The family fell on hard times, Charlie was born in the workhouse and orphaned at the age of 7. The following is an extract from my book which is available on Amazon as paperback and kindle with pages free to view. Chapter II. A Short History of the Family Colls. “Mercy's father, Richard Horton Colls, leased a large house in Hanover Square and owned a great deal of land and property in Norfolk. 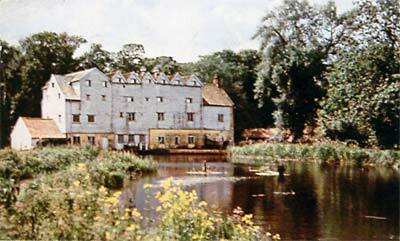 Mercy grew up in the country, at Horstead Mill, surrounded by many brothers, sisters, and several servants. 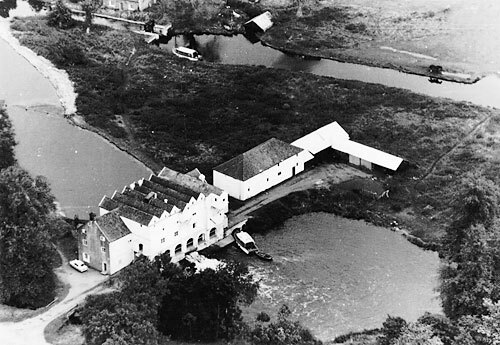 The mill was owned and worked by her father and his father before him. They were Quakers and came from a long line of yeoman farmers, millers and corn merchants, who were highly respected in the city of Norwich. John Colls, Mercy's grandfather, was an overseer at Norwich Corn Market and a Trustee of the Town Lands, where he distributed his rent receipts to the poor. I have illustrated the paperback version of the book and this image appears on page 14. I hope you will find this interesting. 17th September 1814: Joseph Mitchell, married man, aet 73. Mary the wife of Joseph Mitchell, act 73. These poor people came to their death casually & by misfortune as stated in the Coroner's Warrant. 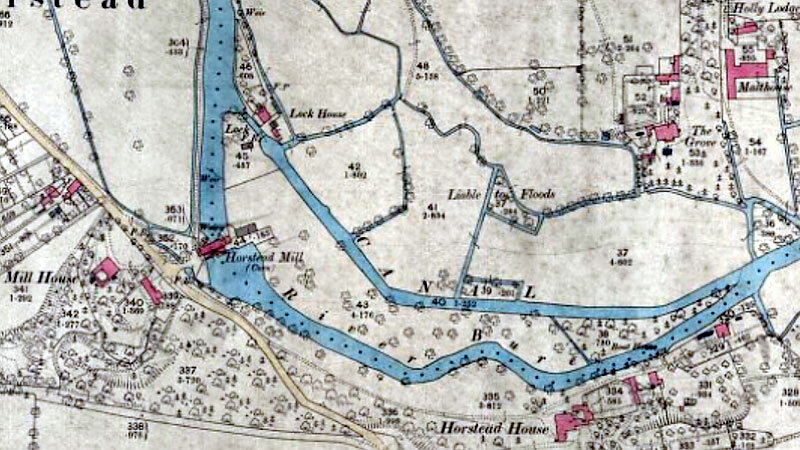 They were paupers & found drowned on 17 Sep. 1814 in Horstead Mill Pool. 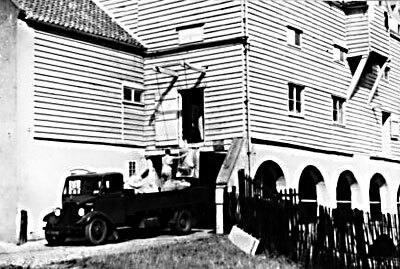 1937: An additional lucum added to the gable end of the mill to cater for road transport.